Actually Thirumala, the richest temple in the world. I decided I wouldn't go to the temple after my last trip there in 1987-1988 but I had to accompany Suji. In over 20 years of my last visit a lot has improved, almost stone-age to civilization difference. Inspite of the dusty environments I was surprised to find Thirupati and Thirumala green, clean and tidy. The one day trip is organized by AP tourism office and operating from the Thirupathi temple in Venkata Narayan road the trip was very well conducted. For Rs.960 you are taken via an Air Conditioned bus and back to Thirupathi. To the hill top a locally running Government Bus is arranged. The trip includes a Buffet style Breakfast and Lunch, a stopover at the Padmavathi temple (on the return trip) and not to forget the Rs.100 special darshan ticket at Thirumala. We took the trip on a Thursday and even for a working day we had to spend close to 3 gruelling hours in the queue and for which reason alone I would never recommend anyone to go through this torture. How many times I recalled Jiddu Krishnamurti's words on "Burn the temples, mosques and Churches..." I don't know. In the Rs.50 queue and the free queues you end up waiting for 7 hours and more. Being a religious trip I didn't want to fire away pics but I did take my camera along. Here are two amusing pics that I took from inside the bus that took us to the hill top at Thirupathi. 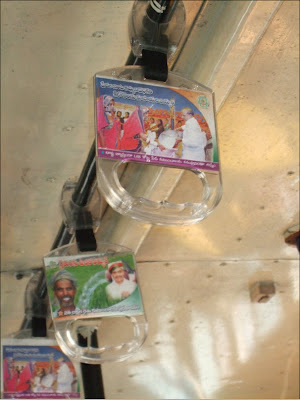 Novel handles for the standees that also advertise the Chief Minister's humanatarian activities. 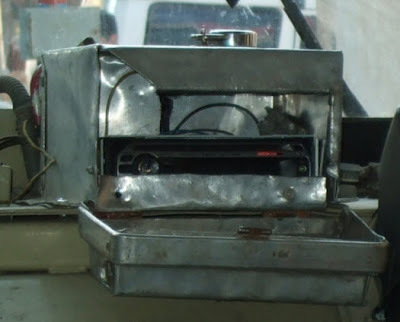 Safe and secure Car Stereo box, that can be locked.